So another friend just got married. And now, like many of my female peers, I’ve found myself daydreaming about future wedding plans. My best ideas: A ceremony on a beach in Thailand, reminiscent of my childhood family vacations in Malaysia; a traditional 10-course Chinese banquet reception, with a special request for Singaporean chili crab; and, if this really were all about me, a durian ice-cream wedding cake to top it all off. Okay, so perhaps the durian ice-cream cake won’t be such a big hit. But I’m convinced that, down to the tiniest details, TCK weddings are fundamentally reflective of our international lives. From friends to food, weddings are a life event where TCKs can attempt to bring together all aspects of our global lives. It starts with the guest list. With family and friends scattered across the globe, uniting a hodge-podge of world citizens is no small feat. “It was challenging,” Sharon Craig Economides, 26, a TCK who grew up in Pakistan, said. Sharon married Tim Economides, 27, last October in Sonoma, California. Although Sharon now lives in California, she spent the first 13 years of her life in Pakistan. Today, her parents work there as humanitarian workers for Afghan refugees. Like many TCKs, Sharon’s network of friends and family defy national boundaries. Sharon rattles off a list of other international guests—a friend who had just returned from the Peace Corps in Africa, another friend from Germany, and of course, her parents, who flew in from Pakistan. In fact, Tim and Sharon had originally planned to get married in the summer of 2009, but in an attempt to simplify logistics, her parents suggested they push their wedding up a few months and schedule it during their pre-planned visit to California in October 2008. “That accelerated everything,” she said. For other couples, the challenge of uniting one’s international entourage can be enough to convince them to keep things simple. Simon Attley, 34, who grew up in England, Japan and the U.S., said that for his extended family, flying from England to Napa, California for the wedding was just too expensive. “Getting married is crazy,” Attley said about the planning process. He and his wife, Izumi Kamitami, 31, were married on Sept. 20 last year at a vineyard estate in Napa Valley. It’s a wedding venue with a stunning view of California’s wine country, but unfortunately he couldn’t share it with friends and family from Kobe, Japan and Liverpool, England – it was too long of a trek. For similar reasons, his wife’s mother was the only family member from her side who flew from Japan for their wedding. Similarly, Sasha Morozoff, 35, who grew up in Kobe, Japan but is of Russian descent, decided with his wife, Lisa, 32, to have a small, intimate wedding. They married on April 27, 2007 by a sakura cherry-blossom tree, in bloom, at San Francisco’s Golden Gate Park. With 10 people at the ceremony—all of whom were family—and 75 people at the reception, their wedding was a celebration focused on their families. Their family-focused decision kept the planning process simple. In fact, Sasha and Lisa didn’t find the ceremony venue until the day before the wedding. Yet because the ceremony consisted of just 10 family members, invitations were not an issue, and their seemingly last-minute decision actually worked out well. But keeping their wedding to family members was not just for logistical reasons, Sasha explains. For him and Lisa, strong family values is a core ideal that they share, and one which, he admits, initially drew him to her. In fact, despite their different religious beliefs—he was raised Russian-Orthodox and she is a practicing Mormon—their shared views on the importance of the family still resonate. For Anne Dodge Carroll, 23, an American adopted from Taiwan and raised in Singapore, making sure family members were present at the wedding meant being a little creative. Like Sasha and Lisa Morozoff, Anne and her husband Crew made the decision early on to keep the wedding to family members only. But for health reasons, Crew’s mother, who lives in South Carolina, wasn’t able to travel to the wedding. The solution? Skype. They had two weddings: first, a legal ceremony in Crew’s living room in Singapore on March 20 2008, and then the actual wedding in Phuket, Thailand, two days later. For the first ceremony, Crew’s MacBook Pro—placed carefully on their living room chair— connected Singapore and Lancaster, South Carolina via webcam. Still, whether forty or four hundred, the guest list is just one of many indicators of a TCK’s cross-cultural upbringing. In fact, it’s often the unassuming details during the wedding that most clearly reflect one’s international experiences. Simon Attley explains that during their reception, a Japanese makeup artist changed his wife, Izumi, from her white wedding dress, a Western tradition, to a Japanese kimono, painting her face with chalk-white makeup and resetting her hair in a lavish, kabuki hairstyle. In Sharon and Tim Economides’ wedding, their experiences in Pakistan, particularly with the Afghan culture, undeniably influenced their celebration planning. Sharon explains that wedding preparations actually began years before. In 2000, Tim Economides made his first trip to Pakistan, where he bought a beautiful white embroidered shawl. Eight years later, that shawl became Sharon’s wedding veil, a long, elegant train that gently trailed behind her as she walked down the aisle. The day before the ceremony, Sharon and her bridesmaids had a henna party, a Pakistani wedding tradition. A henna artist decorated Sharon’s and the bridesmaids’ hands and feet with intricate celebratory designs. “It was kind of like a bachelorette party… It was the only time before the wedding that I got to hang out with the bridesmaids, because they flew in from everywhere,” she said. Indeed, what many local Americans friends consider “exotic” is often nothing out of the ordinary for TCKs. But the vice versa is also true, particularly when TCKs choose their honeymoon locations. For Patrick Linton, an American who grew up in Tokyo and Singapore, exploring the United States with his new wife, Yoshie Takeda Linton, 26, sounded like the perfect honeymoon plan. “Because neither of us had grown up in the US, we decided to use the opportunity to see the country,” he said. 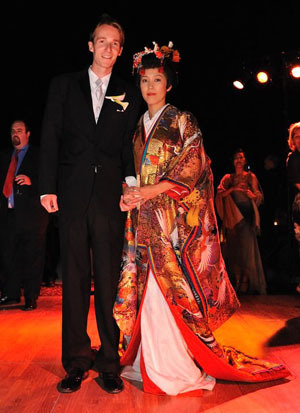 Patrick Linton and Yoshie Takeda pose for a traditional Japanese wedding photograph. At age three Linton moved to Tokyo, then at 11, Singapore. Patrick didn’t move back to the US until college—and even then, he didn’t stay put, studying abroad in Oxford, UK, Hong Kong, and Beijing, China. Familiar with flying to far-off destinations, the next place they wanted to explore was, well, right where he was. Over the course of two weeks, they drove from Boston to San Francisco, stopping at different cities along the way. Similarly, finding a new, unexplored destination was the goal for Sharon and Tim Economides’ honeymoon. “Both of us traveled so much, we wanted to go somewhere both of us had never been to before,” she said. Besides growing up in Pakistan, Sharon had worked in the Philippines and Russia while getting her undergraduate degree at UC Berkeley. She and Tim toyed with ideas like Iceland, or the Seychelles. But they soon realized that, like Patrick and Yoshie Linton, they didn’t have to look very far. Indeed, TCKs often make unusual choices when it comes to planning their weddings. We blur the lines between the foreign and the familiar—Afghan carpets on a traditional wedding aisle, a “skyped” wedding ceremony connecting Singapore and South Carolina, a classic wedding veil tailored from a Pakistani shawl. But perhaps the reason why TCK weddings are so culturally distinctive is because—like everything else in our lives—it’s a jigsaw of cultural experiences, seemingly random but somehow, in the end, fitting together perfectly. Interesting article! It seems that TCKs generally have small, intimate weddings. I’m a TCK who grew up all over the US and in Kuwait. My husband is from Spain but we were living in Costa Rica when we decided to get married. Thinking about how to have this wedding, logistically, was just too hard for me. Eventually, I just gave the whole thing over to my future mother-in-law in Spain and said, “Just tell me when to show up.” My parents, a college friend and my Godmother were my only guests. I kind of regret not including some aspects of my third culture in the preparations. I would have liked a henna ceremony. The Spanish customs included in the wedding were nice, but not as meaningful to me since I’d never lived in Spain! I didn’t even have bridesmaids since that is not done in Spain. It’s just too hard when your friends are scattered all over the world! I love the article. It brought back so much memories – my wife and I got married 32 years ago exactly (today is our anniversary) in England, when I was in my first year undergraduate and she was my secondary school classmate. We weren’t TCKs, except that we were in a foreign land, and not one of our immediate family members attended our wedding. It was fun, and luckily it worked for the last 32 years. Many friends and relatives told me that when they got married in the more usual way, at home, surrounded by hundreds of guests, never enjoyed their wedding day. But our foreignness somehow made it more special, and memorable, at least to the 2 of us. Man, I have a friend getting married in Mumbai, and just planning the whole trip (she told us a year in advance!) was a challenge! I didn’t know (still don’t, in fact) if I’d have a job at that point, and if I did, where that job would be! Booking a flight was kind of a stepping stone “I’ll make sure I’m in Los Angeles on this date so I can take off for India”. And I’m one of the very few of her college friends that can actually make it! I wish more people could, but like the article mentions – it’s HARD to make so many people travel! A friend of mine had a legal wedding and then something like 2 or 3 wedding parties in different cities around the world to accomodate all their friends! Amazing article…I have four TCK..raised in Zimbabwe and Asia…how creative in non-traditional wedding plans..my teens are about 10 years away from all of this…what will this all look like then in 2020? Great article – as a fellow TCK, I wore an Indonesian “outfit” for my wedding gown. My (at the time) future mother-in-law was rather shocked that I would step away from “tradition”! At the rehearsal dinner the previous night, I wore an outfit made in Malaysia (using Indonesian batik)-wearing a sarong with a kebaya (top). The bridesmaids all had orchid bouquets, while I carried a lace fan on which laid a georgeous orchid bouquet. What fun it is to look back at the photos and realize how much my TCK background influenced the decisions made for the wedding. Although I wore a traditional wedding dress, we had 2 weddings! For immigration purposes, the ceremony had to be in America, and so my fmaily and friends flew out there from all corners of the world! 5 months later, we had a wonderful reception in the UK, again with a very cultural array of guests! We incorporated many aspects of my homes, especially through decoration… Malaysia Orchids, of course!! I think the most interesting thing about my wedding (from a TCK point of view) was the crazy intermingling of all the stages, homes, schools and countries of my life! Elizabeth, so glad you enjoyed the article. I’m sure you can pull it off tastefully and make it completely your own–definitely won’t be a circus 🙂 Best of luck in the planning process!! Great article! I’m engaged and soon I’ll be going through the same maddening process. I’m glad to see that couples have always found ways to make it work and get around the traveling issue. I often wonder just where on earth I will get married! Logistics and expenses (for me and potential wedding guests) are a huge concern. Not that I have to think too hard about it yet. 😉 Great article! Great article! When my husband (a fellow global nomad) and I met and married, we were living here in the UK – a country that was foreign to both of us. Instead of trying to incorporate all aspects of each of our backgrounds, we decided to embrace our current ‘host culture’ and we had a quite traditional English wedding. Guests flew in from Hungary, France, USA, Japan and South Africa, wore ascots and hats and were treated to a British roast beef dinner. We did, as a concession to our multi-cultural upbringings, name each table after a country where one or the other of us had lived. The ‘top table’ where we sat was the UK, where we still live and where we have chosen to raise our children. For now. I wonder what my own wedding will be like. Most probably a fusion between, Indonesian, African, Danish and Dutch culture.